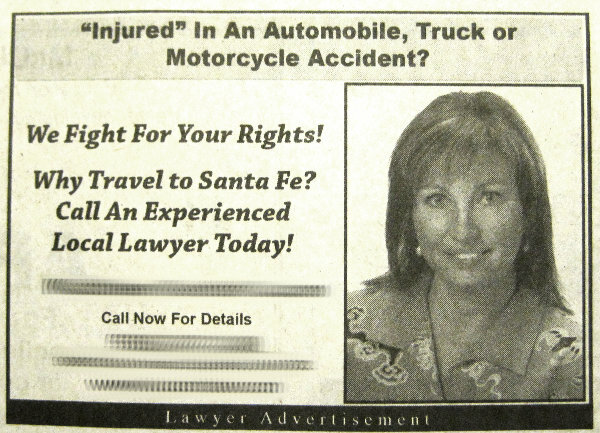 This ad appeared in one of the free Santa Fe weeklies. It's got to be one of the funniest mis-uses of quotes I've seen. One expects lawyers to have a good command of English, and to pay attention to detail, so ... what should we think? "Injured" isn't an unfamiliar word, so it has to be either the first or third use. And whether she's soliciting clients who only say they're injured, or she's casting doubt on the injury, it's hard not to read this as an offer to help people pretend to be injured to collect a payout. Which I'm sure happens all the time ... but I don't think I've previously seen an ad implying it so strongly.